Lunges are a great way to improve strength of the lower extremity. If performed correctly, they an help improve strength in the quadriceps, hamstrings, calf, hips, and core. There are many different variations, and the possibilities are limited only by your imagination. Below are just a few types that I use everyday with my patients. One note about exercises...they may increase pain in some people. 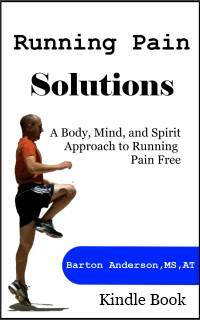 Make sure that any exercise you perform is pain free. Alter the exercise as needed to keep them pain free, and only progress to the next when you can correctly peform the exercise without pain. The forward or anterior direction is the simplest to perform. I have my patients perform two different variations of this exercise, depending on the strengthening goal. Patients who are recently out of surgery or who are suffereing from knee pain will start with the mini or half. Others will perform the inline. The mini lunge involves stepping out onto the leg whle keeping your opposite leg straight. You should try to get your knee right out over your toes, keeping your body upright as you step. Make sure that you push off with your step leg to return to the starting position, rather than pulling yourself back with your stance leg. 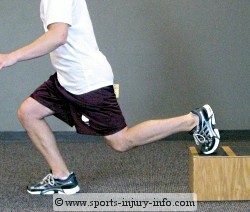 I call this a mini or half because you do not achieve a great amount of knee flexion in the step leg. 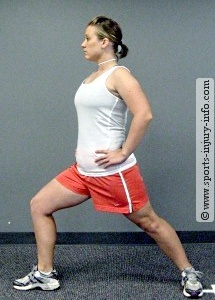 The inline version focuses more on balance and gaining more knee flexion. It is extremely important that you maintain good body alignment with this one for it to be effective. The inline version involves steping out onto one foot, and then dropping the opposite knee to the ground. Your knee should be directly over or slightly behind your toes. Make sure that you keep your chest high and your upper body in a straight line. This can be performed in a slightly staggered stance, or with the feet directly inline with each other. The closer in line your feet are, the more your hips and core have to work to keep you balanced. 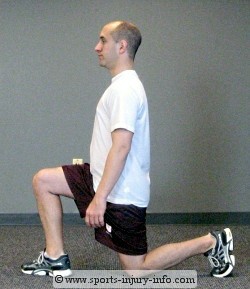 I often take my patients through a series, where they perform mini or half lunges in different directions. This challenges different muscle groups, especially at the hips and in the core. Lateral, (sideways), as well as lateral rotational are the two most common directions I use. Lateral involves stepping onto one leg directly to the side, keeping the toes forward. Keep your body upright, resisting the urge to lean forward. Your knees should be right over your toes, and your opposite leg should remain straight so you get your body weight over your step leg. Push off to return to the starting position. Lateral rotational is similiar to the lateral, but you rotate your foot to point in the direction you are stepping. Rotate your hips towards your stepping leg, and keep your body upright. Push off to return to the starting position. To make these more challenging, you can do lots of different things. You can add weight by holding onto small dumbells. This works very well with the inline version. You can also challenge your balance and proprioception by stepping onto an unstable surface, like a foam pad. To work on control, try stepping off of a small box or step. This forces your body to work harder to control and decelerate as you lunge. Walking lunges are another variation that is more challenging both for strengthening and balance. Start off with performing 1 set of 6-10 repetitions of each one. Increase your sets and reps until you can perform 3 sets of 10 in each direction. Then add weights or use some of the other variations described above to continue to increase the challenge. Lunges are a great way to improve lower extremity strength and balance. Make sure that you keep good body alignment during the exercise, and focus on quality rather than quantity. Increase the challenge by using unstable surfaces and weights.